Over the last 20 years, variable-frequency drives (VFDs) have become the dominant form of motor control in the HVAC industry. 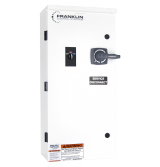 Tremendous energy savings and more-precise control sit atop a long list of benefits that have propelled VFDs to industry-standard status. With this rise in popularity, however, has come increased concern regarding the relationship between VFDs and the electric motors they control. Understanding the complex relationship between VFD and motor requires a clear understanding of fundamental VFD operations and characteristics. To control the speed of a motor, a VFD converts a fixed alternating-current (AC) voltage to direct current (DC) and then outputs a simulated AC voltage. What appears to a motor as AC voltage actually is rapid positive and negative DC pulses that vary in width to mimic an AC sine-wave voltage, controlling output from 0 Hz to the desired speed. This widely adopted method of creating a simulated voltage is called pulse-width modulation (PWM). By changing AC-output cycle time, a VFD is able to do its job: vary output frequency and, thus, control the speed of a motor (Figure 1). So, unlike a reduced-voltage soft start, in which case frequency is constant and voltage ramps up to line voltage, a motor running on a VFD always sees a proportional volts-per-hertz ratio. This allows a motor to maintain intended torque and efficiency ratings. VFDs incorporate motor-protection features—commonly, overload, phase loss, overcurrent, short circuit, ground fault, overvoltage, and undervoltage. Today, some drive manufacturers include application-specific protection, such as broken-pipe and dry-well protection on a pump and broken-belt protection on a belt-driven motor. 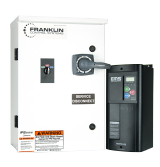 While one of its primary functions is protection, a VFD can damage a motor over time. 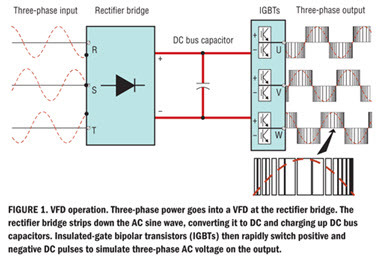 The switching of insulated-gate bipolar transistors (IGBTs) to accomplish PWM on the output of a VFD creates voltage spikes on the line out to the motor. These spikes are amplified over distance and, in time, break down the insulation of a motor, shortening the motor’s life. While this is an inherent problem with PWM, it can be mitigated, as will be discussed. Key to the selection of an AC motor for VFD applications are maximum frequency (required revolutions per minute) and motor-winding insulation class. All AC motors are inductive devices designed for specific frequency ranges. For example, the majority of standard industrial motors are designed for 50 or 60 Hz, with most capable of running at up to 70 Hz. Beyond that, they will overheat, as their magnetic-core steel cannot handle higher frequencies. Inverter-duty-rated motors, on the other hand, are available with maximum frequency ratings of 120 to 200 Hz. They have better winding insulation and a magnetic core capable of handling higher-than-power-line frequencies. 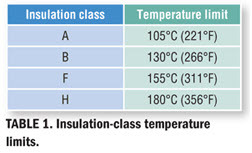 Insulation class is indicated on motor nameplates by letter, which represents a windings-temperature rating (Table 1). Choosing a motor with the proper insulation is critical, as a motor’s lifespan is highly dependent on operating conditions (temperature and moisture). If a motor’s internal temperature goes beyond the limit of insulation, the insulation will degrade rapidly. For example, Class B insulation for a new 480-v AC motor can break down after several months of operation on VFD output. For VFD applications, Class F or higher insulation should be selected when possible. VFD efficiency ratings with the latest IGBTs are as high as 97 to 98.5 percent. The efficiency ratings of AC motors depend on many factors, including winding parameters, magnetic-core material and gap, rotor design, and conductor material (aluminum or copper). Efficiency numbers drop when electrical energy is converted to mechanical, but much of that can be recouped using premium-efficiency motors. For example, the efficiency of a 10-hp NEMA B motor is 85.5 percent, while that of a NEMA Premium motor is 90.2 percent. 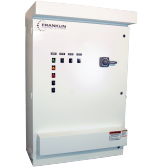 While using a premium-efficiency motor is not a necessity, it can help get the most out of a VFD in terms of savings. Problem: Drive-created voltage spikes that can damage a motor’s insulation, shortening the motor’s life. Solution: Use output reactors or filters when lead length from VFD to motor exceeds 45 ft.
Another cause of insulation breakdown is reflected voltage: high peak voltage with fast voltage rise. On 460-v applications, these voltage spikes occur most commonly when motor leads are longer than 50 ft. NEMA B motors can withstand peak voltage of 1,000 v at a minimum rise time of 2 microseconds. To protect standard NEMA B motors, peak voltage should be limited to 1,000 v, with a maximum voltage rise of 500 v per microsecond. A manufacturer usually will offer “inverter-ready” or “inverter-friendly” NEMA Premium motors. 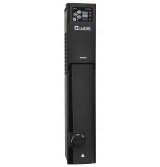 NEMA requires any inverter labeled Premium and “inverter-duty” to handle 3.1 times a motor’s line-to-line voltage at 0.1 microsecond. This equates to 1,426 peak volts for a 460-v motor. Note that being inverter-ready, inverter-friendly, or inverter-duty does not necessarily mean motors have the same ratings. Motor buyers must be careful when relying on manufacturer branding. Most are better off specifying the maximum voltage rating over time. To put both of these ratings in perspective, peak voltages of more than 2,100 v have been measured on 460-v systems with long motor leads. In such cases, an output reactor or filter should be installed. Two factors determine whether an output reactor or a filter should be used: voltage and distance. Voltage refers to the input line voltage feeding a VFD, while distance refers to VFD-to-motor lead length. On a 460-v application, an output reactor should be used for a lead length of 50 to 100 ft; for a lead length greater than 100 ft, a dual-element output filter should be used. 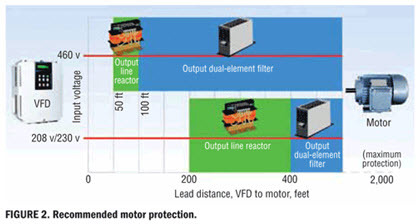 On a 208-to-230-v application, an output reactor should be used for a lead length of 200-plus to 400 ft; for a lead length greater than 400 ft, a dual-element output filter should be used (Figure 2). These cautionary measures are important, as damage to motor insulation is difficult to detect prior to a motor failing. Electricians typically check motor-windings insulation with a 500-to-1,000-v Megger tester. Solution: Adjust the carrier frequency of the drive and/or install a shaft-grounding kit. When a VFD applies high-frequency pulses to a motor, the parasitic capacitance between stator and rotor generates voltage on the motor shaft. When this “common-mode voltage” exceeds the dielectric limit of the bearing-grease film, a short circuit between shaft and grounded stator occurs through the bearing. This creates discharge arcing and shaft current. 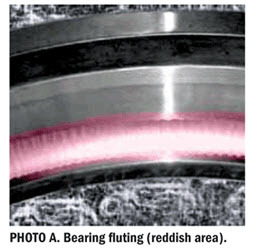 These random and frequent discharges damage the surfaces of bearing raceways and moving parts (Photo A). This damage, called pitting or fluting, can be minimized or avoided by lowering a drive’s carrier frequency or installing a motor-shaft ground brush. Solution: Adjust carrier frequency or install sine-wave filters. A VFD can create noise when the output voltage applied to a motor has a high (up to 15 kHz) switching (carrier) frequency. The noise level can be very high if carrier frequency is close to motor-windings resonance frequency. 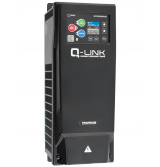 The problem can be addressed by changing the carrier frequency on the VFD or installing a sine-wave filter. Nearly all VFDs allow carrier-frequency adjustment in the field; a sine-wave filter is costlier and more time-consuming. Problem: Older motors failing when VFDs are retrofitted. Solution: Install output reactors, output filters, or motor sine-wave filters. One of the most effective ways to increase the efficiency of an HVAC system is to conduct an energy retrofit on the controls. 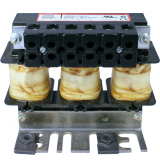 Typically, this involves replacing old wye-delta, part-winding, and single- and two-speed motor starters with VFDs. While this is an effective way to lower energy costs, certain precautions are needed to prevent damage to existing motors, as old motors usually are incompatible with VFDs and have aged insulation, which can fail on VFD output. To avoid issues, one should install output reactors, output filters, or motor sine-wave filters. Doing so can enable years of continued use. VFDs can adversely affect a motor’s life. When VFDs are applied properly, however, the benefits far outweigh the potential problems. It is important to understand the issues, which can be addressed easily during the selection process. Tommy Trullinger is an application consultant and product manager for Cerus Industrial Inc. He is a graduate of Concordia University in Portland, Ore., and an affiliate member of ASHRAE.